Order Ricola Cherry 32g from the Online Health Food Store UK. Buy Ricola Swiss Herbal Sweets Cherry - 32g and other quality Sweets safely online in the UK. Ricola Cherry Honey brings two great tastes together to create a sweet and soothing herbal sweet for tired, scratchy throats. Ricola Cherry Honey brings two great tastes together to create a sweet and soothing herbal sweet for tired, scratchy throats. Refreshing, natural cherry combined with rich, soothing honey and Ricola's mixture of 13 medicinal Swiss mountain herbs creates a taste totally unique to Ricola. Ricola herbal sweets are perfect for relieving minor everyday throat irritation such as dryness, hoarseness or scratchiness. Ricola is nature's way of calming coughs and soothing sore throats. Our UK Health Shop sells real Ricola and other Sweets from top-quality brands safely online to customers throughout the United Kingdom in England, Wales, Scotland and Northern-Ireland. 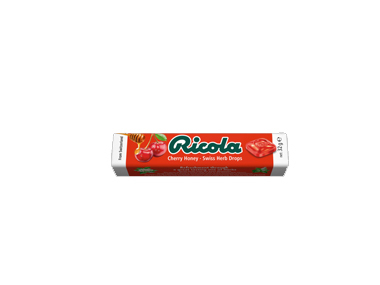 View more products on the Online Health Food Store from Ricola. Where to buy Ricola Cherry 32g safely online? Shop at the Online Health Food Store if you are wondering where you can buy Ricola Swiss Herbal Sweets Cherry - 32g safely online in the United Kingdom. Ricola Cherry 32g - Ricola Swiss Herbal Sweets Cherry - 32g in Sweets and Confectionery.